There can be a tremendous savings when installing tires yourself. Tires can be purchased at lower prices over the internet or by mail order as well as the savings that can be had by mounting and balancing them yourself. Besides that, you will know it has been done right. One of the challenges encountered doing it yourself is being able to balance the wheel assembly easily and effectively. 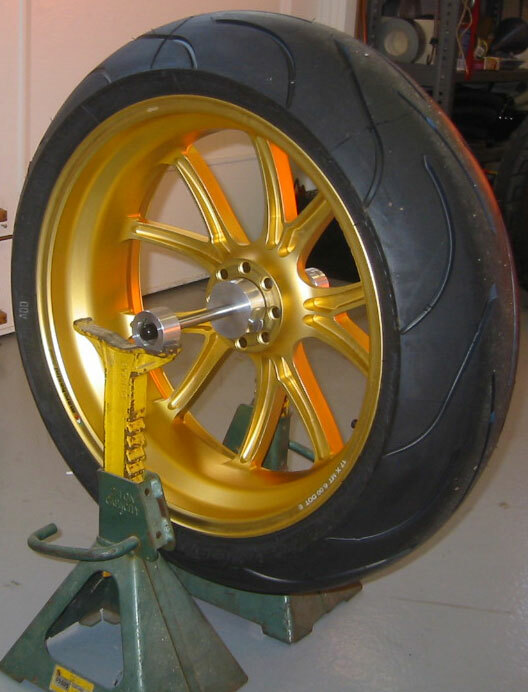 A motorcycle tire balancer is often expensive, takes up a lot of room and in the case of VFR, requires a special rear wheel adaptor which is available from the dealer at a premium price. 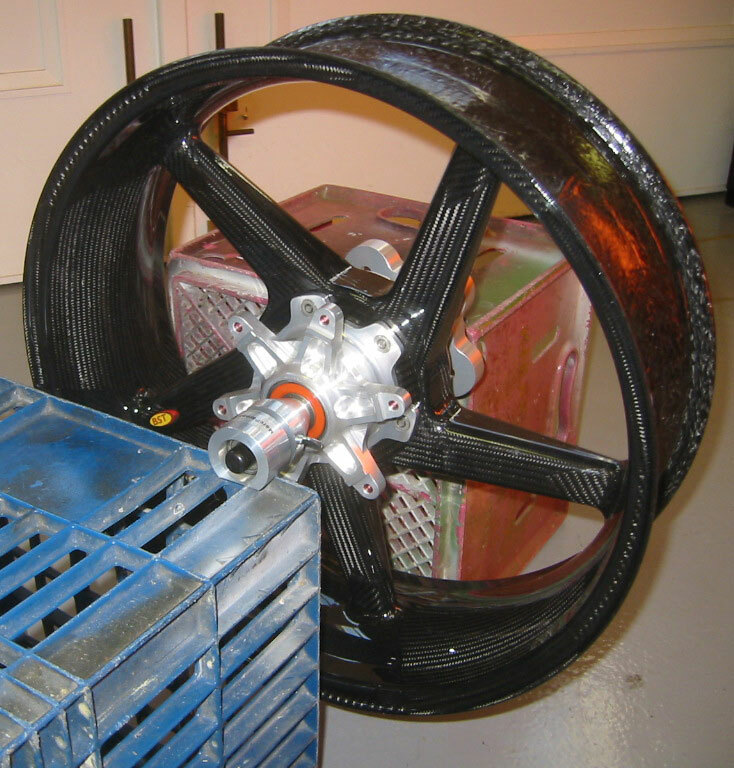 The MV Augusta Portable Motorcycle Wheel Balancer pictured above addresses all of these problems. Extremely accurate running on precision low friction shielded ball bearings. Simple to use. 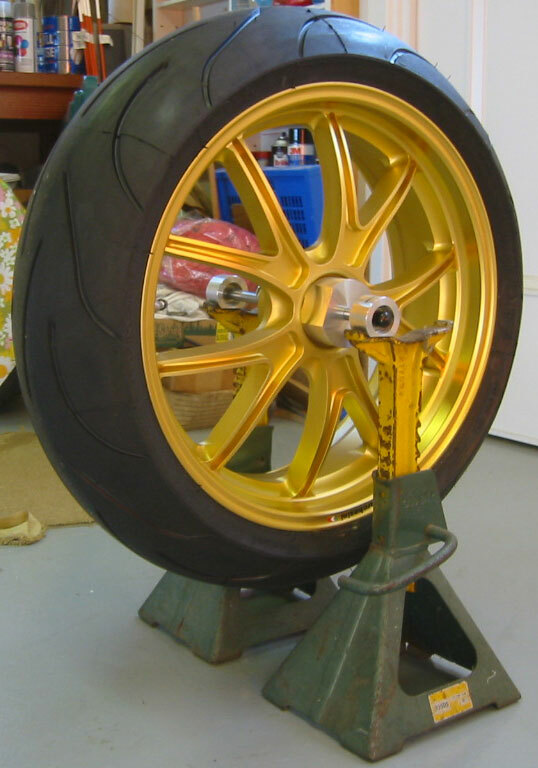 Please review the Motorcycle Wheel Balancer Instructions. DOES NOT require a Dealer supplied rear wheel adaptor. Portable, it fits in your tool box drawer or tankbag. Overall size - 12" x 1¾"
Axle - Tool Steel 12" x ½"
Please click on the thumbnails below to view the balancer in operation. Purchase with any major credit card through PayPal! If you prefer other means of payment besides PayPal please call (714) 842-9210. PayPal has simplified their process. New PayPal users are no longer required to open a PayPal account. You simply input your credit card information. When you're finished you will be given the option to save your information on PayPal or not. That's all there is to it! When purchasing through PayPal please make sure that the email address you're entering is correct since we will be emailing you a shipping confirmation. We get many of them bounced back because they are incorrect or obsolete. If you are a current PayPal member you can update your email address by going to your PayPal account and clicking on the Profile tab and then the Email tab. *International Shipping. Shipping to the US via Priority Mail is free. To all other countries please specify First Class Mail or Priority Mail. Priority is faster and comes with a tracking number. All shipments are insured for the full amount. Claims cannot be filed until 45 days from the ship date and 60 days when shipping to Italy. In addition they do not insure shipments to the following countries so we will not accept orders from these countries as well. They are: Afghanistan, Algeria, Angola, Belarus, Bosnia, Burma, Burundi, Congo, Cote d Ivoire, Ivory Coast, Croatia, Cuba, Congo, Herzegovina, Iran, Iraq, Jordan, Liberia, Libya, Moldova, Montenegro, Myanmar, Nigeria, North Korea, Paraguay, Russia, Serbia, Sierra Leone, Somalia, Sri Lanka, Sudan, Syria, Togo, Yeman, Zimbabwe. Canadian Customers Please Note: When ordering balancers or a combination of smaller tools I urge you to take advantage of Priority Mail Shipping. It is much faster than First Class and includes a tracking number so we can find it if it gets delayed which unfortunately happens in Canada fairly often. We don't play the Shipping and Handling game. Most sites these days advertise one price and then get you with an excessive shipping and add-on handling charge during the checkout procedure. They figure if you've gotten that far you'll probably just go for it. We think that's sneaky business so all of our prices to the US include shipping right to your door. For delivery outside of the US please refer to the International Shipping prices above. If you have application or special mounting questions please leave feedback.